A Silent 55 Cruiser launched by Austrian eco-catamaran specialist Silent Yachts is to become the first solar powered yacht to sail in Asia. The 16.7 metre yacht, which was delivered to charter broker Burma Boating, will now be offered for charter around the Mergui Archipelago from this month. The three-decked catamaran can accommodate a total of six guests in four cabins equipped with queen sized beds and private ensuite bedrooms. The yacht will be run by three crew, including skipper Captain Ajun May, who has previously skippered in the archipelago. 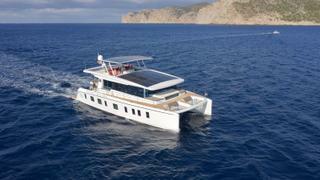 Built in 2018, the S55 will be the first 100% solar powered boat to sail in Asia, according to Silent Yachts. It will be powered by the sunlight captured by its 30 mounted solar panels, which will generate enough energy to enable unlimited travel on an average sunny day. The two silent 30kW motors will achieve a top speed of 12 knots. The S55 is also equipped with a backup fuel-based engine. General manager of Burma Boating Eric Poepper said: “The S55 will leave a minimal environmental footprint but offer travellers unprecedented sailing comfort. 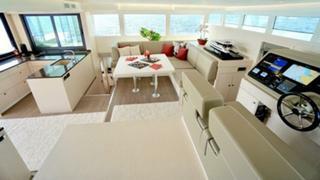 It comes after Silent Yachts revealed that construction began on three models of its Silent 79 Cruiser series in November.